Welcome to our Council "Notice Board". From time to time there may be events or postings we would like to advise the or make available to the public but are only required for a short time. This page will be updated regularly and from time to time may even redirect you to other websites such as the Visitors Centre or MRC&LC. 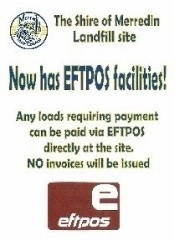 The Shire landfill site now has Eftpos facilities. Special precautions must be taken when removing asbestos cement products. You may seek the services of an asbestos removal contractor, or you may choose to remove the material yourself. Contractors must comply with the requirements of the Occupational Safety and Health Act 1984 and Regulations. Please refer to the attachment for the correct proceedure fo the disposal of asbestos at the Shire of Merredin's Chandler Road Landfill Site.